To get a high-resolution poster or print of this image (many sizes available, even huge ones!) click here. From the APOD: Cradled in cosmic dust andglowing hydrogen, stellar nurseries in Orion the Hunter lie at the edgeof a giant molecular cloud some 1,500 light-years away. Spanning nearly 25 degrees, this breath-taking vista stretches across the well-known constellation from head to toe (left to right). The Great Orion Nebula, the closest large star forming region, is right of center. To its left are the Horsehead Nebula, M78, and Orion's belt stars. In this 3x8 mosaic of broadband telescopic images, additional image data acquired with a narrow hydrogen alpha filter was used to bring out the pervasive tendrils of energized atomic hydrogen gas and the arc of the giant Barnard's Loop. Congrutalations from Spain for another APOD!!!!! This photo is fantastic. I love Orion. Rogelio, felicidades,mi pronóstico se está cumpliendo...estoy tan contenta que voy a festejar tu nueva APOD. Simply, best mosaic I saw!!! Before seeing your picture, i didn't know it was possible to obtain this result from earth. This is a master piece!!!! 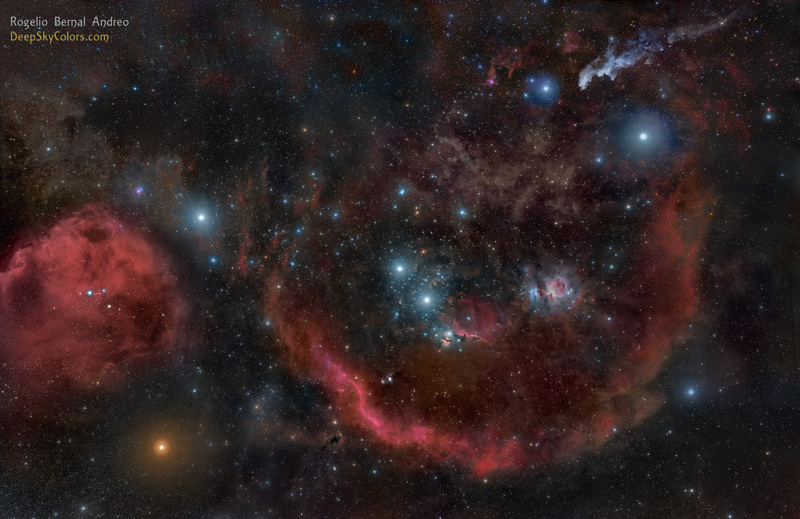 I've been waiting decades to see a photo like this that shows all of the wonders of Orion in one color frame. This may be the single best and most impressive astroimage I have ever seen. Fabulous work! Analizando la foto más despacio pude localizar la fotogénica cabeza de caballo, es una más de esta preciosa nebulosa que encanta, la presentación en esta imagen... es inédita...la he comparado con otrs fotos de la nebulosa de Orion y creo que no la superan, sobre todo porque está en todo el conjunto que la rodea, bien empleado esa frase utilizada "Orion, de pies a cabeza". Wow, I was almost stunned.. I have never seen such a detailed and deep image of this area until this one. It is a glorious image and one to be marked for the ages! Thank you everyone for your wonderful comments and taking the time to post them! Bob, what moved me to embrace in this project was indeed the fact that I too wanted to see a full (or almost full) image of Orion in one color frame. I haven't had time to write my own comments yet, but one thing I will be mentioning is that the mosaic isn't finished and I'm hoping to be adding a few more frames to it in the next couple of months. Zoila y Javier, muchas gracias!! Genius, your wide field images will become the benchmarks by which all future efforts will be judged. Your Orion image is the best I can remember seeing. The detail is exquisite. I used to be able to trace Barnard's Loop visually through a C 8, but of course not with that detail. I will try that again with my 6" AP when Orion gets higher. Excellent work Rogelio!and was most worthy of the APOD! Rogelio, tus fotos son extraordinarias. Felicitaciones acompañadas de sana envidia. Sos un genio. Esta noche voy a mostrar esta foto en una charla sobre El universo invisible. Está bien? Thanks everyone - Chris, Jack, Louie - for your comments! Guillermo, por supuesto, no hay ningún problema. Waau!Your work and skill is simply incomprehensible i have never seen anything like this before. Hubble is blown away!!.. Rogelio, beautiful pictures. I'm so thrilled to learn you live nearby! I took my own first successful images at Coe (with a Canon 60D), and recently acquired an SBIG ST-7 with filter wheel. I hope to try it out as soon as the weather improves. I'd love to tag along some time and watch you work. Simply breath-taking! Masterpiece!!! Well done, sir. Perhaps the best APOD ever made! A magnificent work of art. I like this one so much that I'm using it as my desktop wallpaper. Hola Rogelio! He conocido tu página a través de tu amigo Luis, al que recientemente conocí cuando acudí al Corte Inglés de Murcia para informarme sobre unos telescopios. Me dijo que visitara tu página inmediatamente si aún no lo había hecho y... guau! Qué puedo decir... Me uno a todos aquellos que se han quedado perplejos ante tanta maravilla y tanta perfección en el arte de la astrofotografía. Enhorabuena por tal azaña y por todos tus logros tales como premios y concesiones al APOD. Realmente una recomendación brillante, tendré tu página en favoritos y la seguiré muy a menudo de ahora en adelante. De nuevo, mis felicitaciones, un saludo! Rogelio, I have been looking at this photo from time to time. It is just absolutly beautiful. Thanks everyone for your comments and for stopping by! A great inspiration , your blog reads like a boys novel . One of the most amazing/beautiful astronomical images I've seen; this is stunning. WOW!!!! I `have never seen such detail in wide angle astrophotography . Beautiful!! Amazing image indeed. May I ask, did you also bin the Luminance images or are these 1x1? Kayron, L is unbinned. I rarely ever bin luminance. I have only just discovered this image. It is absolutely stunning. Not only is it an awesome astro image it is truly educational in that it captures the Orion Molecular Complex and puts all the other nebulae in context. This image truly deserves the accolades and all credit to Rogelio for producing it and sharing it with the world! Kudos. Maravillosas fotos; comienzo a ver las cosas de otra manera. Felicitaciones.